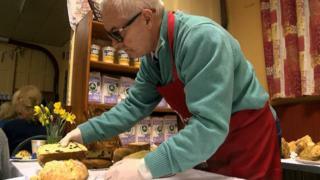 A Manx baker has been crowned the "world's best bonnag maker" at an annual competition in the Isle of Man. Carolyn Kinrade walked away with the overall title beating more than 40 other entries at the World Bonnag Championships in Dalby. Dominic Gordon won the men's title and Eva Jones emerged with the children's title. The event's lead judge Paul Kelly, who has more than 40 years experience, said the Manx sweet bread is particularly difficult to judge. He said: "I never taste them - I go by smell and texture. If they are too high in bicarbonate of soda you won't taste the rest because it kills your taste buds." Mr Kelly added: "A good bonnag maker needs to be a good chef with great knowledge but no matter how good they are, it won't always come out perfect." Image caption The annual competition has been held in the Isle of Man for more than 20 years.